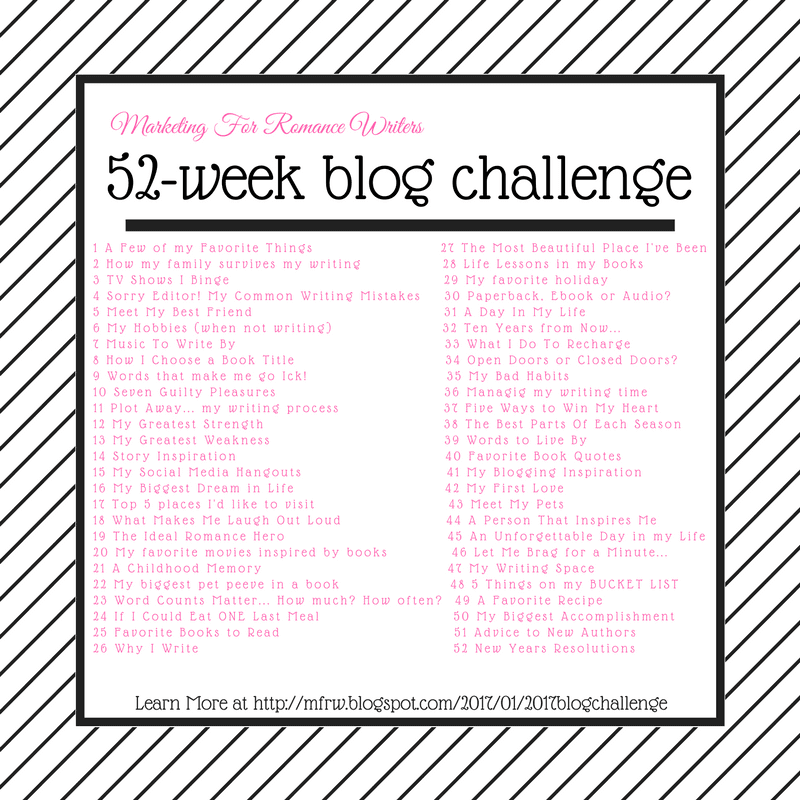 Hi and, welcome back to the MFRW52week blog challenge. This weeks topic is opened doors or closed doors. I sat here scratching my head for a long time. What the heck does this mean? I am stumped. Does it mean do you prefer open or shut doors in your home? I like the shut. I have am a bit OCD and I go nuts if someone leaves a cabinet door open or a door half-open. Now the entry door is another story. When it is nice outside I open mine since it is in the office so I can see out and it lightens my office. Molly and the cats fight over the pillow in front of it to look out too. Career wise I have had a few doors slammed in my face. I submitted two stories to two different publishers and was rejected. As I have learned more I see my mistakes and why the stories were rejected. One of them even sent me a letter and told me of the mistakes and to fix them and resubmit she would review and give me a second chance. I never did. I just put the story in an unfinished pile and I may work on it at another time. The other was for an anthology and they only chose so many. Both of these publishers have closed their doors so it was a blessing in disguise. I still have the rights to them and didn’t have to fight for them back. I am considering self-publishing with my current story so that is an open door as I don’t have to worry about a publisher rejecting me. I still may submit someday and face the doors again. Do you face doors opening and closing? Open and Closed Doors to the Future or Bedroom? Open doors. . . or closed doors? You know what they say — if you aren’t failing, you aren’t trying. Having doors shut in your face proves that you’re out there in the trenches, getting the work done! Yes, doors often close and others open. Life flies. I also hate open doors on cabinets (not so much on regular doors, unless they lead outside). I’m with you on the rejection door (been there, too), but it’s okay if I can figure out the reason and improve my writing. Good luck! Facing a closed door is always hard, but I try to look at it as an opportunity to grow more resilient. (or maybe because I can be stubborn) Great post! great way to look at it, Maureen! I’ve not tried the traditional route. I’ve not queried and submitted and waited on the possible rejection. Maybe I will someday, but it’s a door I’ve not walked through as of yet. I’m with you on the cabinet doors. Drives me nuts when they’re left open, unless I’ve left it open for a specific reason, but it gets closed asap. Closed doors that wouldn’t open for me? Garth Brooks’ ‘Unanswered Prayers’ comes to mind. I submitted two stories for an antho that were rejected, so sent them elsewhere. The one rejected twice is the one which ultimately got me through the Published Author door with another publisher.